Under the magical calm of Cozumel’s turquoise waters, visitors can discover one of Mexico’s most valuable treasures – the marine life. If you want to see this hidden world in Cozumel, you should get involved in a el cielo snorkeling tour; this is a convenient, fun and cost-effective way of exploring the blue waters around Cozumel Island. 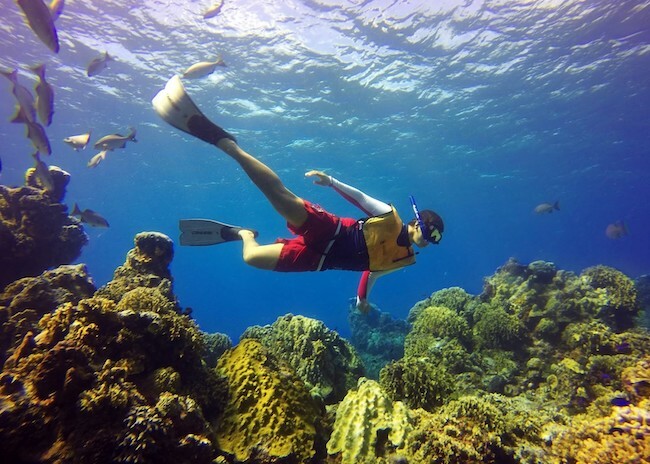 Although there are some interesting sites on the east, the most popular snorkeling sites are on the west coast. Colombia Shallows Reef is one of these west coast snorkeling sites. Where is Colombia Shallows Reef located in Cozumel Mexico? Colombia Shallows Reef is one of the largest reefs in Cozumel. It is in the southwestern part of the island close to el cielo beach. It’s almost impossible to get to the beach by foot because the beach is far from the Quintana Roo C-1 road. The best idea is to use a boat tour that focuses on snorkeling, and the good news is that we are offering the perfect snorkeling tour that includes Colombia Shallows Reef. Don’t miss this chance to explore this area while using adequate snorkeling equipment and the guidance of our experienced guide who knows Colombia Shallows Reef inside and out. Why is Colombia Shallows the best Snorkeling Reef in Cozumel? It is tough to say which reef in Cozumel is the best, but some things make this reef ideal for snorkelers. These things can make Colombia Shallows Reef look like the best option you have here. For starters, this reef is in an area that looks like a natural bay. As the name suggests, the water is not very deep, and the experience level needed for snorkeling in this area is beginner/novice. You can expect mild or weak currents all year round. On the bottom of this reef, you will find shallow coral heads placed on the floor of the ocean covered with white sand. Colombia Shallows Reef is around 30’ deep even though it can reach up to 50’ in some places. The coral systems we’ve mentioned are available in many different sizes and shapes, and they can reach up to 25’. What species will I see on my Cozumel Colombia Snorkeling Tour? When it comes to marine life, this area blesses with extraordinary life forms. For instance, hawksbill sea turtles, as well as a green sea turtle, are probably the first thing you will notice in the waters. You can also see some excellent examples of moray eels, barracuda, octopuses, starfish, angelfish, grouper and other species of exotic fish. Even though they are rare, you can also spot some sennets, butterfly fish and damselfish. The colorful reef will spice up your holiday in Cozumel which is why it is highly recommended to take a snorkeling tour that includes Colombia Shallows Reef. No matter how experienced or new to this you are, Colombia Shallows Reef, such as palancar reef for snorkeling, will help you have a good time in Cozumel. Use the snorkeling tour for the most exceptional snorkeling experience you will ever have.